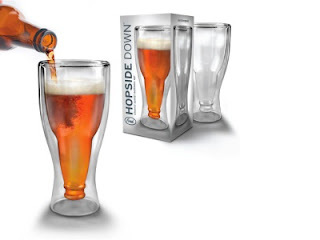 The Hopside Down beer glass is the answer to the man who wants to be a mate's mate and enjoy a beer with the lad in the backyard but also wants to (or their significant other wants them to) show a bit of class and style. It's basically a bottle turned upside down in a glass so that the beer goes into the bottle bit but you hold the glass. As well as being blokey and stylish, its also a nice little novelty which will generate some interest and conversation at parties. Perfect for that guy who can't decide if he's prefers a bbq in the backyard with a few mates or a couples night with the some of the Girlfriends friends. Packed Full of Love has a great selection of gifts for men and women, kids and babies, to suit any occasion and a variety of different tastes, come and have a browse.